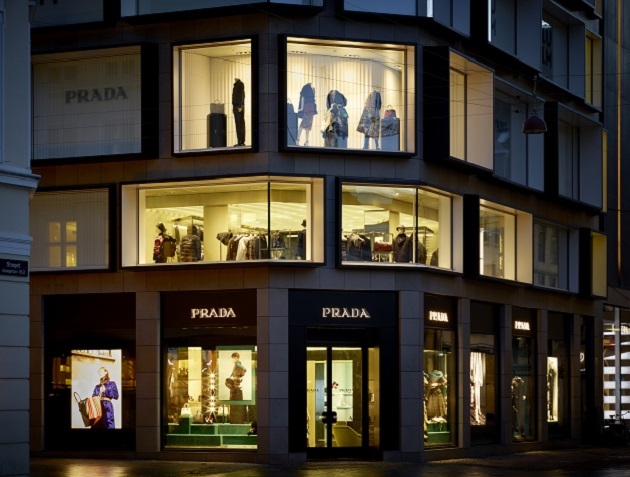 Prada opens its first flagships tore in Copenhagen,inside the prestigious department store Illum which La Rinascente took over in 2013 located in Ostergade, one of the main shopping streets in the city. The external façade is characterised by a sequence of display windows and light-boxes, creating a design in harmony with the architecture of the building. The new space covers a total surface area of 900 square metres over two retail levels and offers the women’s and men’s ready-to-wear, footwear, accessories and leather goods collections. 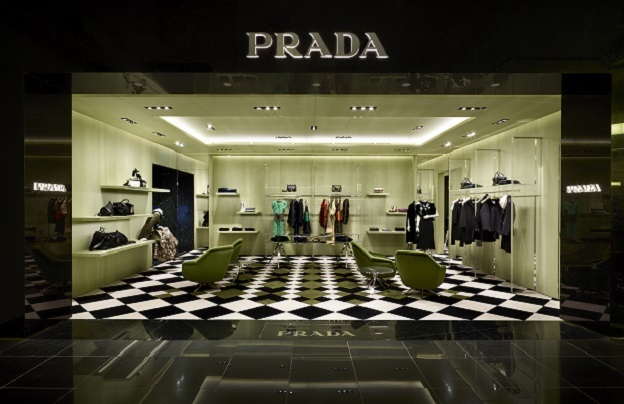 The store concept combines Prada’s consolidated heritage with the freshness of modernity. Not forgetting references to iconic Italian designs, such as Osvaldo Borsani’s velvet chairs,reproduced exclusively for Prada. 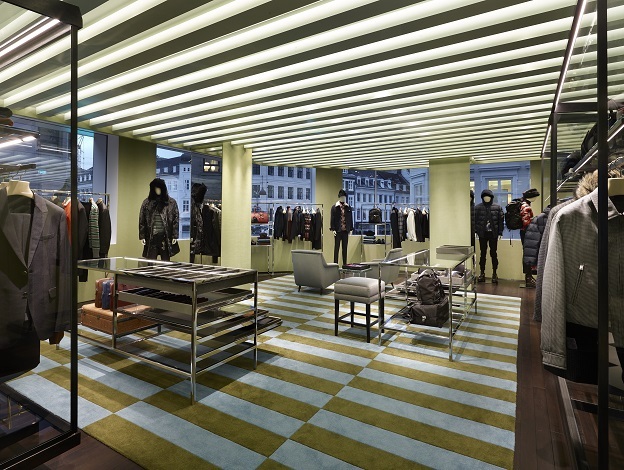 The first space features walls covered in water coloured canvas in shades of deep green, a black-and-white checker board floor, glass display cases with green Alpine marble shelves, and beamed ceilings in Prada green; offering a modern interpretation of ceilings found in historic Italian buildings. 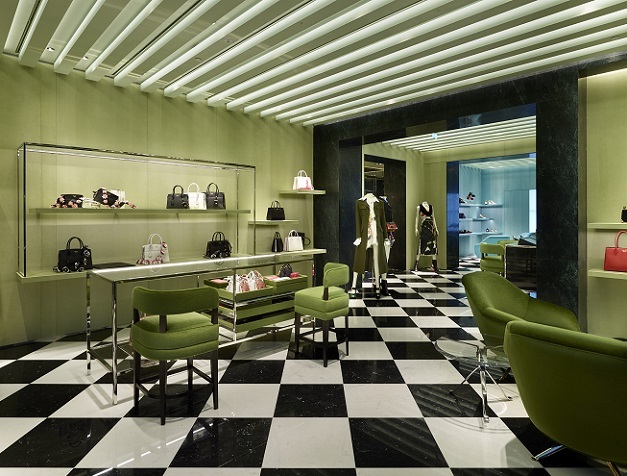 A series of doorways framed in green marble lead to the adjacent areas: shaded-green canvas wallc overings and shelving characterize the area dedicated tot he women’s leather goods and accessories collections; light blades of acrylic and display walls distinguish the women’ready-to-wear one. 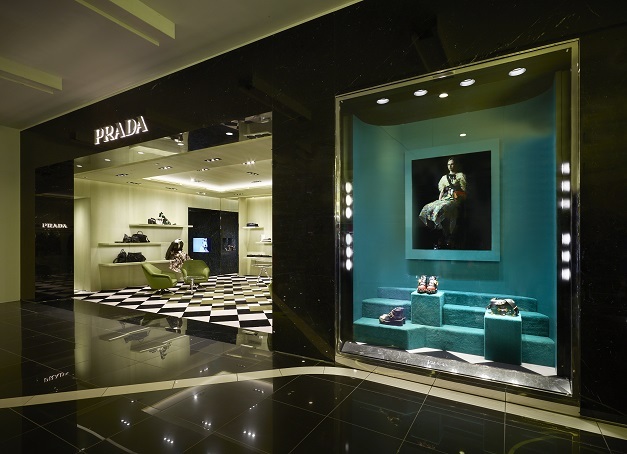 Bold colors define the rooms where footwear is offered: water coloured canvas is of a turquoise hue, as is the seating upholstery and even the display shelves. An Alpine green marble staircase leads to the upper floor. 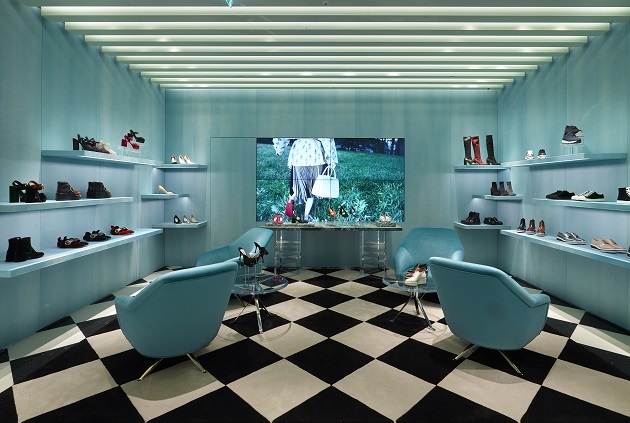 Here, the video walls, the chequered floors and the beamed ceilings give a masculine attitude. The canvas is in shades of air force blue, as is the velvet for the chairs.The men’s footwear room features the air force blue shade, with grey velvet chairs and geometric-patterned carpeting. The men’s ready-to-wear collections’ area is distinguished by a number of elements such as the narrow-plank ebony flooring and shaded-green canvas walls.Iron and glass display cases, green velvet chairs and coloured carpeting give the space elegance and character.